If you want to be able to laze and relax once you get there, plan ahead. IF YOU PLAN ahead for your hotel stay and car rental, you won't waste precious time on the road negotiating for a room or vehicle. It's wise to spend a couple days nailing down all the details for your lodging and transportation before you fly out of town or country. in Lisbon. The hotel was booked months ahead. * MOST OF US go on line to find room rates, but it's a good idea to call the hotel directly after you fine rates. Ask for a discount. The websites often tout "lowest price" because they're selling themselves. I've often been given a discount by hauling out all my memberships: AARP, AAA, and mentioning my frequent business travel. You may qualify for a corporate or senior rate. Ask. Most hotels do a room inventory that expires each night, so you might call at a time when you can save $15 or $20. Don't call the chain's toll-free number. Call the individual property. Cookie meets a old friend, Lucilla, a noted historian, at the Rome airport. offer, automatically raising your bid in increments until one is accepted or the highest offer is rejected. * WE'VE ALSO booked short trips with Groupon Getaways, Overstock's Vacations, Yuupon and Living Social. All offer deals but many are not as unique or enticing as advertised. Last year we booked a long weekend in Mexico through Groupon then had to cancel three weeks out, well within the terms of the initial agreement. It took three months and endless faxing and phoning to get the $750 credited back to our card, so be sure you know when you want to go and hope you don't have an emergency that necessitates cancelling. Print out all your documentation as you go, and keep good records. 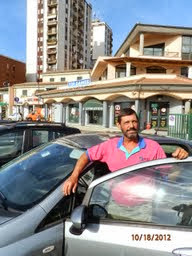 Keller prepares to take the wheel in Spain. * WATCH OUT for short redemption periods. Be wary. Usually they are up to a year, but I lost nearly $800 once booking a sweet sounding five-day trip to Hawaii. The redemption window was only six months, and I hadn't paid proper attention. When I went to confirm actual dates, the "bargain" had expired. If you don't think you'll go for awhile -- or don't know when you might be able to take advantage of "the bargain," perhaps it is not worth risking. * There are fun aps for hotel booking. One is called Hotel Tonight, so if you have a smartphone, you can find the name of the hotel before you buy. Sometimes you can land good last-minute rates, too, by calling the hotel after the 24-hour cancelation. The no-show people who don't want to get charged for the night will have called to release their rooms. * CONSIDER upgrading to a larger room especially if you're traveling with a family. Sometimes you can get a much larger space -- a corner room or suite -- rather than booking a second room. An upgrade might also offer the incentive of a hot tub or complimentary breakfast, and may cost only $20 or $30 more. Key Largo hotels and condos offer plenty of activity in nearby environs. * When possible, rent other than at the airport. It's often cheaper in a downtown or suburban location. Sometimes airports tack on extra fees. Again, check it out first. * If you arrive in the evening and are planning to travel only to your hotel the first night, call the hotel shuttle to get yourself there for just the driver's tip, and save an extra day's car rental fee. * Many of the big car rental companies offer an on-line discount for paying ahead. * Be careful about renting a car in one city and dropping off in another. Establish the rate at the beginning to avoid penalty fees. 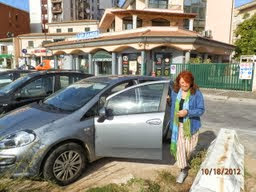 Cookie's got the keys for a rental car in Sardinia. Off to explore! * IF YOU'RE renting for four or five days, check the weekly rate. It is often cheaper than the daily rate times four or five. * Don't be afraid of renting a car in Europe or elsewhere abroad. We've done it the past five years -- always with success. Interestingly, European rental car rates have been cheaper than domestic for us, plus you get the fun of driving at your own pace in an exotic location.